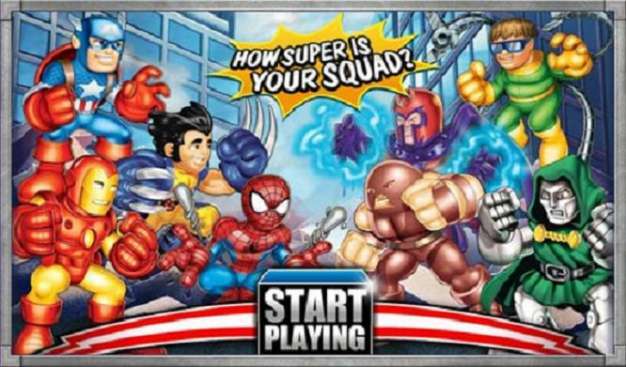 Last year we reported that THQ caught a development deal with Marvel to publish games based on the Hasbro toy line Marvel Super Hero Squad. If you haven’t seen the toys and found the above image horrifying (Wolverine looks bigger than Juggernaut and he’s smiling) then brace yourselves because we’ll be seeing a lot more of them. Not only are we getting this creepy kids game for Wii, PS2, DS and PSP, but we’re also (and by “we” I mean little kids that wouldn’t rather see Wolverine rip someone apart) going to be assaulted by the cartoon series this fall on Cartoon Network. Super Hero Squad takes heroes like Captain America, Hulk, Iron Man, The Fantastic Four, Silver Surfer and Wolverine and pits them against Dr. Doom’s Lethal Legion. The Legion is out to collect fragments of the Infinity Sword, which give new powers to anyone that can get their hands on them. So, not only do they have character specific attacks and powers, but whoever has an Infinity Fragment gets more. Going up against the likes of Dr. Doom, Loki, Magneto or a suped-up Juggernaut sounds scary, but just looks adorable…’er stupid, I meant stupid. This brawler allows kids to choose from over 20 Marvel characters, even their favorite baddies, and toss them into Battle Mode or play out six campaigns from the upcoming series in Adventure Mode. I’m not sure what is more horrifying: putting Marvel on the same level as Dora the Explorer or THQs announcement that this is only the first game in their licensing agreement with Marvel.